I should preface this review by saying that I have a long history with the TrackMania series, having spent hundreds of hours of play time on the previous games. If you are a console-only gamer and don’t have any experience with this series, know this review is not for you. 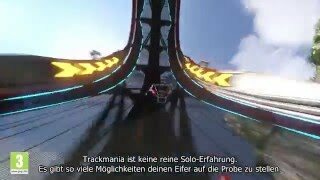 TrackMania Turbo in isolation from its predecessors is in many ways a fun and addicting racer with tight controls and a good amount of online and offline options. However in comparison to previous iterations on the PC, Turbo is missing core features that make it very difficult to recommend as an alternative to the robust, albeit slightly obtuse suite of TrackMania products available on the platform. In broad strokes, Turbo closely resembles the structure of its predecessors, but with a nicer interface and all four environments bundled into one package. In the campaign mode, you will race for medals on increasingly difficult tracks by getting fast times. You only ever race against ghosts; there is no collision between cars. 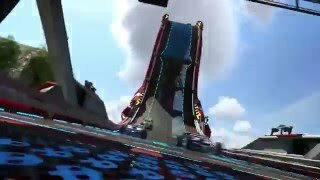 In online multiplayer, you can take as many cracks at a track within a given time span as you can manage, and whichever players have the best single-run time at the end will be atop the leaderboards. You can create custom tracks in a track editor with simple, normal and advanced versions that let you build tracks every bit as complex as the ones that ship with the game. While it is great to have all of these features in a tidy package, something is lost along the way. I spoke at length in my TrackMania 2: Canyon review about the importance of the community in this series, with user-made tracks and player hosted servers being in many ways the backbone of the experience, the thing that kept me coming back to see what new tracks were being made and if I could beat my local record on old favorites. In this sense, Turbo has had its legs roundhouse-kicked out from under it. The online multiplayer options are severely limited; players can no longer host servers, instead, they are forced to create ‘rooms’ which will be hosted on Nadeo servers. This might seem like a superficial change at a glance, especially since the location of a server doesn’t matter since you are only ever racing against other player’s times meaning latency is a non-issue. It matters because you no longer have local records on servers that help you gauge your progress on a favorite track. It matters because the custom plugins and music that really put the ‘mania’ in TrackMania are no longer possible. It matters because the heart of the series always resided on ever-populated servers that ran a carefully curated list of tracks that attracted a dedicated playerbase. These servers were the reason I put two-hundred hours into TrackMania 2 Canyon instead of twenty, and spent hours carefully designing tracks with the hopes I would be able to get them onto my favorite server. While it is possible to create a room with a good track-list that stays up as long as it is populated, without the option for player-hosted servers, I can’t see Turbo pulling the small but dedicated community that still exists in TrackMania 2. Servers support up to one hundred racers, but the option to disable their ghosts is gone, resulting in a cluttered screen that makes it harder to concentrate on putting down a good run. Competitive offline options have also taken a hit. While you can see where you stand in your regional rankings, you won’t actually see the times put down by those who are ahead of you. Previously you could download the ghost of any other player and race against it, now this option is limited to people on your friends list. 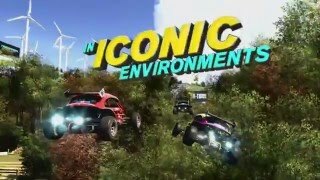 One thing that Turbo does have going for it is the existence of four environments in one package, the most of any TrackMania game. In classic TrackMania fashion, the cars and handling are tied to the environment with no option for alternatives. The drift-centric Canyon environment and fast, grippy Stadium environment are still great, and I still don’t much like the looser more sensitive handling in the Valley environment. Unfortunately the new environment added here, Rollercoaster Lagoon, suffers from similar issues. Despite some really cool new track pieces that let you drive vertically or even upside-down for extended periods of time, the handling feels a bit too finicky and overly sensitive, and it seems the community agrees as the majority of populated servers are in the Canyon and Stadium environments. The 200 solo tracks provided by Nadeo are of mixed quality. The developers seem to have learned from the community-made tracks in TrackMania 2 for the Canyon environment, as I found these tracks were fairly good. The other three environments left mixed impressions, especially the new Lagoon environment with some very frustrating tracks that force you to deal with long stretches of sand that are difficult to drive on without losing control. The way you unlock tracks is by earning medals, with there once again being four medals to earn for each track. Instead of having separate progression trees for each environment, you must switch back and forth between them. In order to unlock tracks in the third difficulty tier and up, you will need to have silver medals in every single preceding track. I would have preferred separate progression paths in each environment as players would be able to focus on their favorite instead of forcing themselves to get decent times on the ones they find frustrating. It is a terrible feeling when the only thing stopping you from unlocking additional tracks is one that is causing you a lot of grief in an environment you’d rather not be playing in. Despite all of this doom and gloom, there have been some good additions to TrackMania Turbo. The expanded suite of local multiplayer options are probably the biggest and best addition. Classic splitscreen mode returns and lets you race on any track you like with up to four players. There is one screen where you can enter a random combination of keys or buttons on your controller and this will select a unique mode, like hotseat where you and your friends take turns to get the best time, or mono-screen racing where both cars must stay within the single screen to avoid being kicked out of the race. There is even a bizarre new mode called Double Driver where two players control one car, taking input from each which can lead to hilarious results. The track-editor returns, and has seen significant change from previous games in order to work with a controller. Despite some good additions like automatic track decoration and the addition of a third editor tier between simple and advanced, I found the controls for building tracks unwieldy and unintuitive with both mouse and keyboard and a controller. After you put down a track piece, the next one will automatically be connected, and you must press an additional button to disconnect it and move it. The option to name a track doesn’t even appear to be present, and there is still no in-game way to share custom tracks. You can even auto-generate a random track, though the tracks I produced using this method were usually not very good. Nadeo have always been known for making good looking games that run well, and Turbo thankfully continues this tradition. The game appears to use the same engine as TrackMania 2, but with a bit of extra spit and polish. It’s a good engine and Turbo generally looks sharp apart from some blurry textures in the environment you probably won’t notice when speeding past. The game also runs at a blazing frame rate, though I did experience an issue where the game refused to render at 1080p, as long as I had a second lower-resolution monitor connected to my PC at the same time even though I wasn’t using it. The original soundtrack is energetic and goofy and can be ‘boosted’ (made louder) by pressing a button. You can customize which tracks you want to listen to, though the relatively limited number of songs means you probably will get tired of hearing the same ones over and over. One of the most annoying additions is a disembodied voice that will say things like “nice focus!” when you are racing well or “whoa! watch the paint!” when you hit something. I got tired of this after about two races though thankfully it can be turned off. Other audio assets sound like they are ripped straight from past TrackMania games, though they are still fine. TrackMania Turbo is not a bad game, but when compared against its PC predecessors, it is a disappointing one. Nadeo had a great opportunity to reunite its currently fractured community and bring in new players with a game that ditched the clunky ManiaPlanet interface while retaining the fun gameplay and deep customization options that help foster a long-term dedicated community. While Turbo is not a bad buy for console gamers curious about the series, if you have even a semi-capable PC, I would suggest picking up TrackMania 2: Stadium and Canyon instead. Turbo looks sharp overall and the soundtrack is fine though it could use more songs. Other sound assets are similar to previous entries. Stadium and Canyon still offer up great handling, though Valley and Lagoon can feel finicky and lead to frustration. Having a single progression path for all four environments is not a great idea, tracks are of mixed quality though the Canyon and Stadium ones are mostly decent. Online multiplayer is a huge step back from previous TrackMania games though improved local multiplayer options are great. The game runs great, though I ran into some bizarre issues with resolution caused by having multiple screens with different resolutions. TrackMania Turbo is missing some crucial features from the past PC iterations, however the core formula of racing for times on crazy tracks is intact enough to still provide some basic fun. "Speeds right past the series' biggest strengths"
TrackMania Turbo is ranked #1131 out of 1434 total reviewed games. It is ranked #107 out of 138 games reviewed in 2016.